I have found chicken keeping to be therapeutic, relaxing, rewarding and fruitful. Except for those times I find it tragic, frantic, exasperating and somewhat pointless. I enjoyed a mix of these latter emotions over the weekend. While mowing the yard Rob found this nest under the propane tank. I have two thoughts on this. Number one ~ We should mow the yard more often. 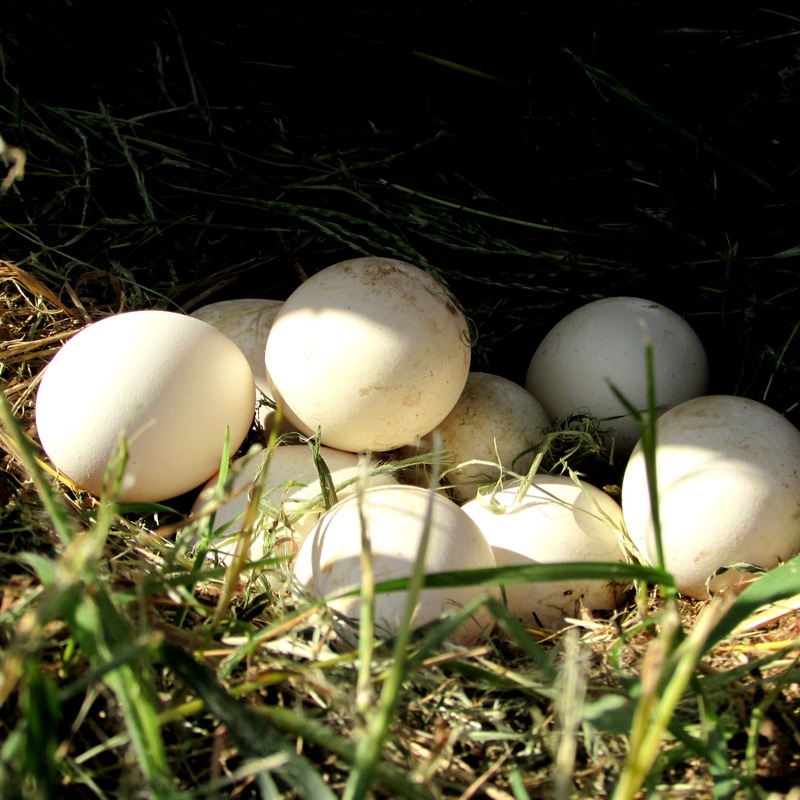 Number Two ~ Rouge chickens waste eggs. These will all go into the compost pile. Which isn’t entirely pointless but I’d much rather have eaten them and composted the shells. Exasperating. I went to lock up the girls (and guys) for the night and was happily gathering eggs from the nesting boxes laid by chickens who actually KNOW what is expected of them and tada! Sneaky Snake! I really wish snakes made some kind of noise to announce themselves. Maybe a bark or perhaps a chirp of some kind. Anything other than just laying there in silence next to my flock, half its body in a nesting box while the other half clings to the coop wall, all the while eying me with those black, bottomless, soulless, wicked eyes. Enter hoe, husband and me in a bathrobe, flashlight in hand, breathless from my mad dash to the house. This was the frantic part. I really dislike touching snakes. 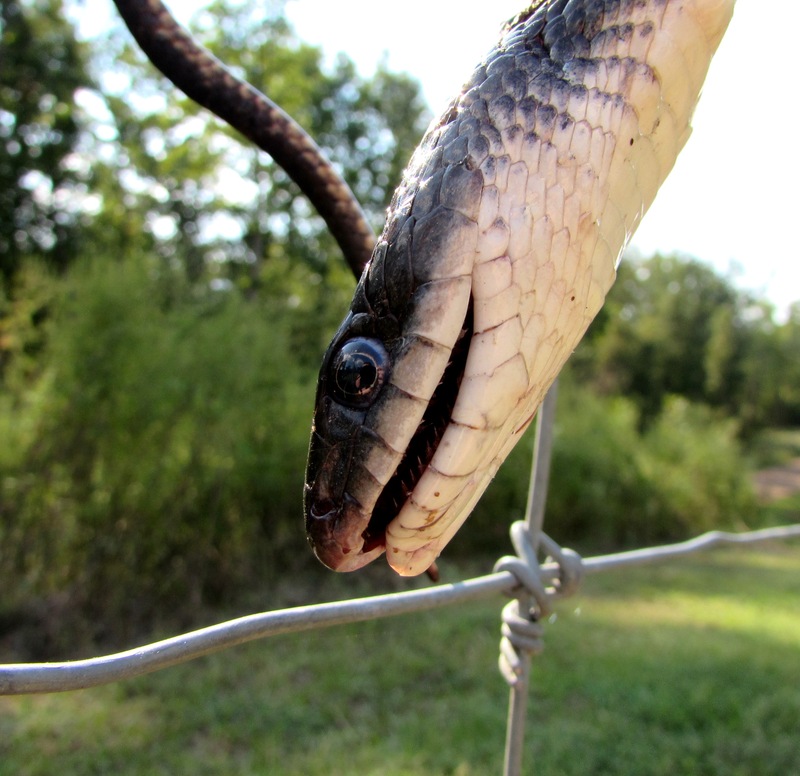 As much as I dislike snakes and as much as I abhor touching them it still saddens me to end their life. Everyone has to eat, everyone is just trying to survive. I comfort myself with two thoughts. A buzzard or owl will be thankful to have this long, skinny meal with little to zero effort. 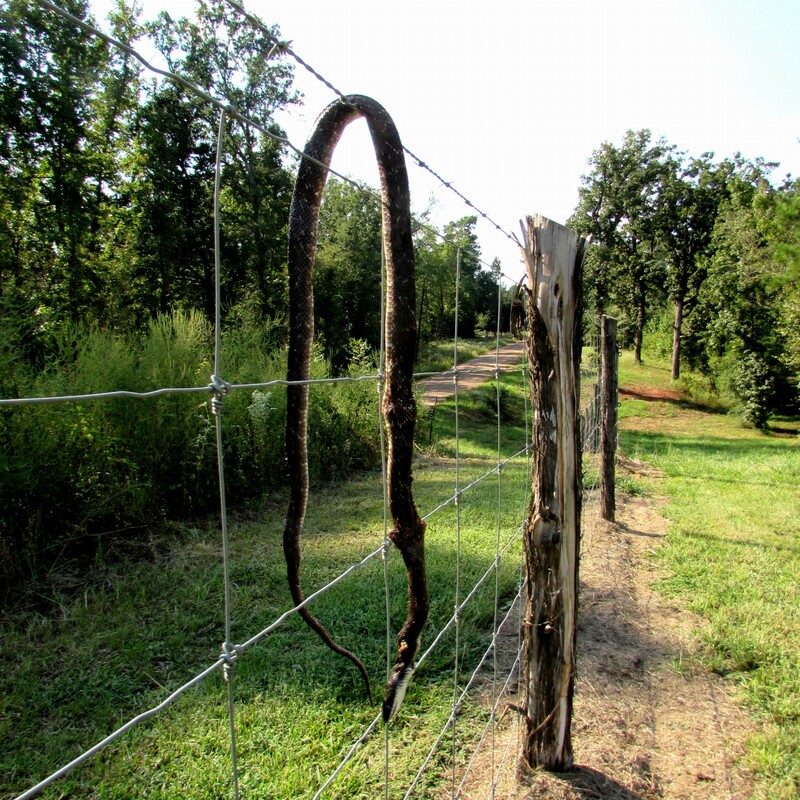 I always place the chicken snakes on the fence in this manner and they are gone within a couple of hours. And my little chicken, you know this one…..
She is safe. She is so tiny even a small chicken snake could swallow her whole. And that would be beyond tragic. I’d have to take a leave of absence, anti-depressants and would probably turn to the bottle then my entire life would be over. Okay, maybe not. But it would be one of the worst days of my life. So, Mr. Chicken Snake. 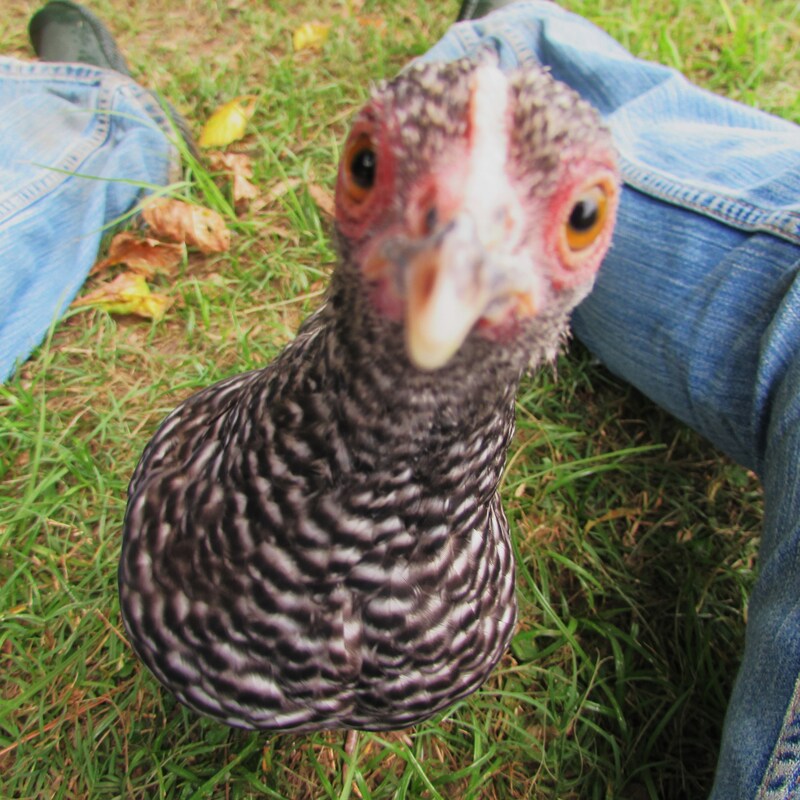 If you are needing a snack, please just go check under the propane tank and stay out of the chicken coop, okay? That little chickens eyes get me every time! I have not run into a snake yet, and I hope I never do!! What a wicked looking snake…of course they ALL are, but a closeup shot really shows it! So pleased we don’t have snakes hiding out in the chicken shed. It’s bad enough when a mouse runs across in front of my hand while I’m reaching for an egg. They are SO super creepy! I’ll take a mouse any day! 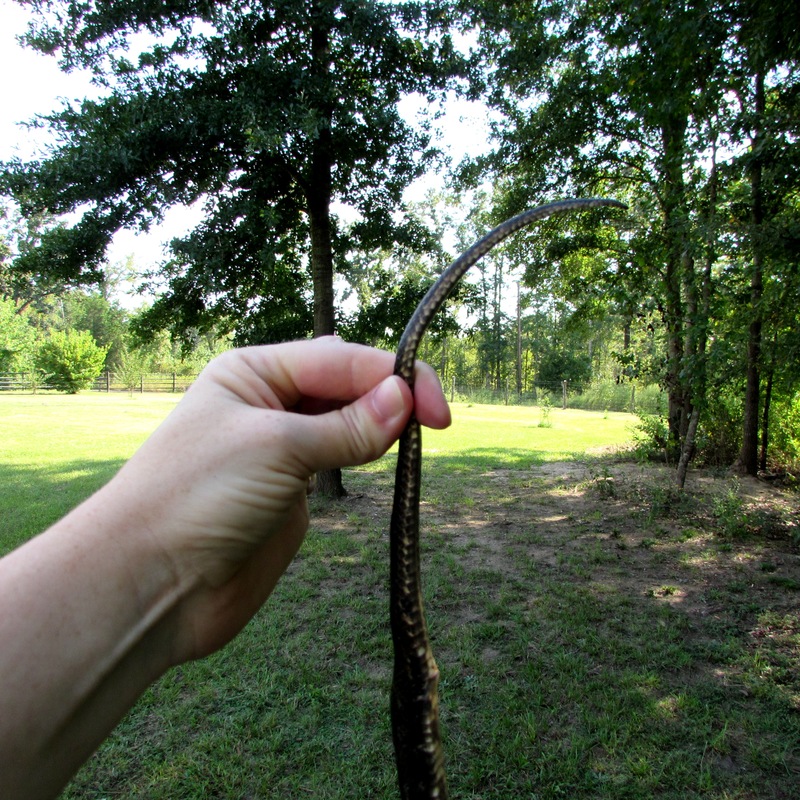 That’s a BIG snake….looks healthy (well-fed).